In December 2016, the small African island state of Sao Tome and Principe cut diplomatic relations with Taiwan and recognised China. Panama followed suit in June 2017. It now looks likely that the Vatican will sever diplomatic ties with Taiwan as it normalises relations with Beijing. If it does, it will represent the loss of Taiwan’s last remaining official diplomatic relationship in Europe, and the latest in a long list of severed ties. 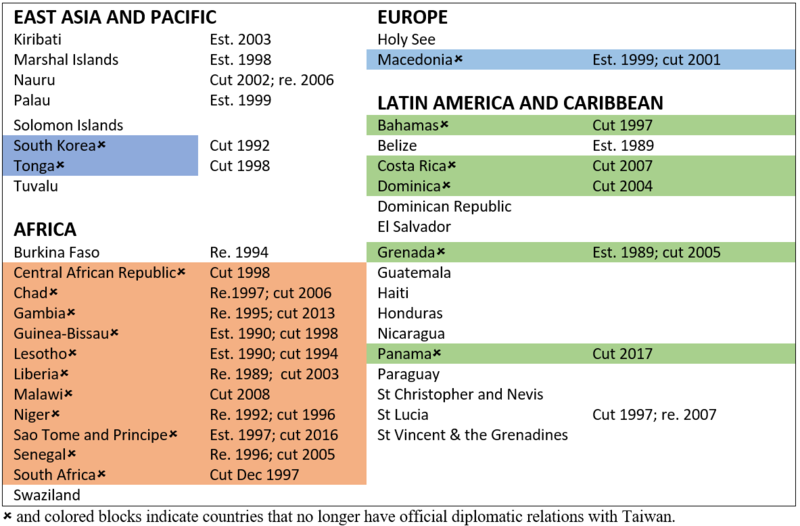 There are now only 20 countries that officially conduct their diplomatic relations with Taiwan in the same way they do with other independent states (see chart below). Like his predecessors, Chinese leader Xi Jinping apparently sees this as an effective stick to scare Taiwan in the direction of unification. But is he right? How important are these relationships? To my mind, this is the clearest way to understand what Xi Jinping is doing to Taiwan. He is performing a ritual to declare Taiwan a non-state, and hoping that others believe in it. Unfortunately for Mr. Xi, he has his work cut out—not least of all because “non-states” don’t exist in our collective imagination. Let me explain. In the modern world, we have a category above the state, i.e. international organisations, to which states hand over a modicum of sovereignty in return for shared benefits. We also have a category below the state, perhaps called a province or colony, which has a certain degree of autonomy but is ultimately subject to the sovereign authority of the state. And then of course we have the most important category, the state itself. While no doubt a complex phenomenon, the state can be seen in essence as an institution with a monopoly over violence within a prescribed space. In practice of course, the distinction between these categories is not always clear cut. Max Weinreich’s distinction between a language and a dialect is useful here. Just as a language is a dialect with a navy, a state can be seen as a province or colony with its own navy (and an army and an air force). Of course the process of acquiring a navy can be a messy one, as is discerning the point at which a rebellious province or colony mysteriously transmogrifies into a state. That transition point has huge consequences. This is not least of all because while invading other states has become increasingly rare and frowned upon, waging war against rebellious provinces remains more socially acceptable (though clearly much less acceptable than it used to be). The crux of the problem for the Chinese government is that Taiwan doesn’t look like a province—not even a rebellious one. Much like we think “duck” when see a bird that looks like a duck, swims like a duck and quacks like a duck, when people look at Taiwan their brains tell them they are looking at a state. And why wouldn’t they? Taiwan is big like a state, with a population twice as large as Belgium’s, and a nominal GDP larger than Sweden’s. It is free and democratic like we think the best states should be. It has that essential monopoly on violence; indeed, by one calculation it boasts the 18th most powerful military in the world (5 places above North Korea). You need the Taiwan’s government’s permission (not China’s) to enter, whether through carrying a visa or a passport from the growing list of countries with a visa-free visiting agreement with Taiwan. Taiwan issues its own postage stamps and currency that are accepted around the globe. And no matter how hard you look you will not see any signs that Taiwan is “breaking away” or rebelling. The reality is that it has been there doing its sovereign thing since before most of us were born. China has a more formidable collection of carrots and sticks than most with which to try and overcome this fundamental conceptual problem, to make us disbelieve our lying eyes. Evidence of this is all around as it pushes governments, individuals and private companies into bizarre Orwellian contortions and dissembling over Taiwan. But China’s influence is not absolute, and employing its carrots and sticks means engaging in trade-offs on other issues. And, the actors China most needs to influence—because they are powerful and active in Taiwan’s region—are the most difficult to sway. The simple reason is that their very activity in the region brings them face-to-face with the reality of Taiwan, and their power means they have a shared interest with Taiwan in maintaining their autonomy and own influence in the face of a rising China. All of which means that countries fall along a spectrum between absolute acquiesce and absolute resistance to China’s point of view. At one end are countries that vocally support China’s right to use force against Taiwan. Toward the other end are the United States and Japan. They agree to fudge Taiwan’s status as a state, such as setting up a separate system in lieu of exchanging embassies and ambassadors. Yet they support Taiwan’s continued independence in many important ways. The US’s designation of Taiwan as “major non-NATO ally status” is just one example. The 20 countries that have official diplomatic relations with Taiwan are quite different. Values can and do play some part. But they are all geographically distant from Taiwan and have relatively little in common with Taiwan economically or strategically. Rather, they are all relatively small and/or poor countries (see chart below) that resist China’s pressure and inducements in return for aid and other support. The exception is the Vatican, which has not been able to come to an agreement with Beijing over the appointment of bishops and so recognises Taiwan essentially by default. Population size and GDP per capita ranking relative to all other countries for 19 countries officially recognizing Taiwan (the Holy See is excluded). 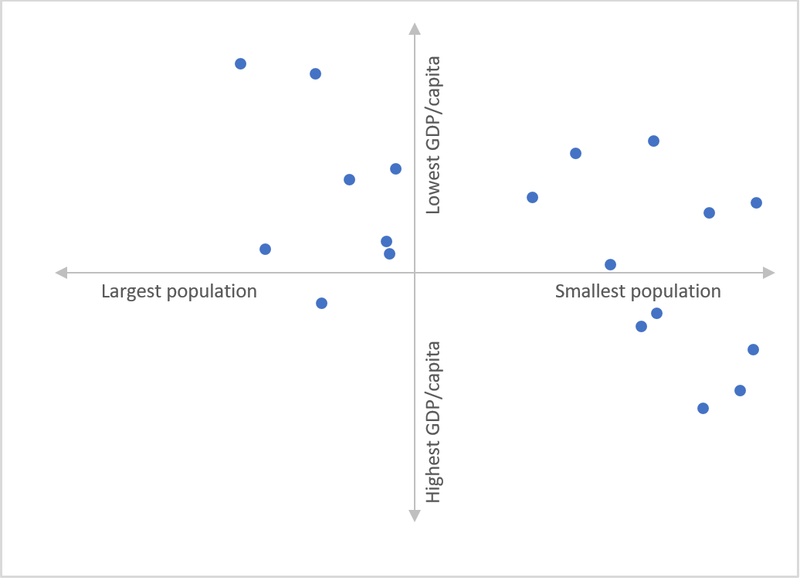 Population and GDP per capita rankings are from the UN. Taiwan calls these countries “diplomatic allies” (as I will also do here for convenience). But the role of these countries is much more ambiguous than this label implies. Yes, they help Taiwan ritually assert its statehood and amplify Taiwan’s voice in international forums. However, as I said above, they also provide Beijing with a handy means to engage in a ritual stripping of Taiwan’s statehood. Especially useful is the thermostat precision with which they can be used to incentivize Taiwan toward unification. Because it was seen as moving in the right direction, the previous KMT administration of Ma Ying-jeou was rewarded with a “diplomatic truce” in which Beijing did not accept the defection of Taiwan’s diplomatic allies. The current DPP Tsai Ing-wen administration is seen as moving in the wrong direction, hence the loss of Panama and others. Of course, the only way this can work is if the assortment of individuals we call Taiwan collectively care about this ritual. The Taiwanese public have tended to be somewhat ambivalent about the importance of the “diplomatic ally count”. All things being equal, most people seem to want the number of allies to be higher. At the same time, there is a general feeling that giving money to these governments to win or maintain their support is wasteful and bad. Taiwan governments past and present have had to manage these contradictory desires, as well as limit the collateral damage of maintaining the “ally count” on Taiwan’s international reputation. Most notably, there was a period in which Australia criticised and worked against Taiwan due to what Canberra saw as the destabilising impact of Taiwan’s money in its South Pacific “backyard”. The current Tsai administration has responded to Beijing’s pressure in a measured way. It has continued to provide aid and strengthen ties with existing allies. But she has not engaged in risky attempts to win new allies that could alienate the public and international critics. Despite China’s formidable might, this strategy is sustainable in terms of Taiwan’s resources. Taiwan spends very little on aid compared to other wealthy aid donors, and can afford to spend more to maintain its official diplomatic relationships. It can also afford the premium required to provide aid in ways that earn Taiwan greater recognition as a generous and effective donor. 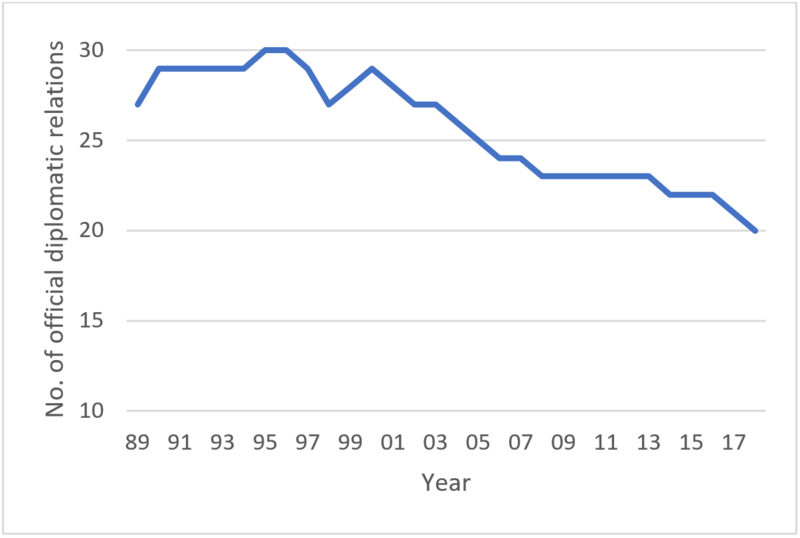 Another thing to keep in mind is that China is running up against the law of diminishing returns. Each ally that China takes frees up more aid dollars for Taiwan’s remaining allies, making each progressive ratcheting up of pressure that much more expensive. And logically, the least “loyal” allies are the first to go, leaving China with an increasingly challenging pool of relationships to try to interrupt. President Tsai’s approach is also sustainable in terms of Taiwan’s wider international relations. Officially unofficial relationships with big, influential, democratic countries like Australia are clearly more important to Taiwan’s long term future than its diplomatic allies. So it was clearly counterproductive to maintain Taiwan’s official relations in the South Pacific at the expense of its relationship with Australia. With China’s aid to the Pacific Islands stirring increasing controversy in Australia, Taiwan’s conservative, low key approach is good public diplomacy. Ultimately, however, whether the current approach proves to be sustainable will depend on the Taiwanese public. Beijing is counting on the Taiwanese to grow more alarmed and anxious with each ritual stripping of a diplomatic ally, and therefore accommodate to its unification policy. This could happen directly, or via Dr. Tsai or a future president seeking to win new allies in a “diplomatic money game” that alienates the public and other countries. While this cannot be ruled out, Beijing’s assumptions at each step are highly problematic. Remember, Taiwan looks like a state and behaves like a state. This is perhaps more obvious to the Taiwanese who live their lives surrounded by it than anyone. And the more diplomatic allies that Beijing takes away—without any noticeable impact on the “state-ness” of their country which they experience every day—the less they may care. After all, even if the Taiwanese collectively continue to believe that the existence of official diplomatic relationships is an important part of the ritual that sustains the existence of their state, it is hard to see how a marginal reduction in the ally count changes things. Does a state need 20 diplomatic relationships to exist? Wouldn’t 19 do? Why not 18? In the same way that successive terrorist attacks lose their symbolic potency, the public may become increasingly numb and hardened to each successive ally lost. In which case, Chinese pressure will merely serve to alienate Taiwan, not force it into the mood to negotiate away its autonomy. After all, since 1990 China has taken away 19 diplomatic allies (see table below), yet Beijing’s dream of unification seems as far away as ever. Joel Atkinson is an Associate Professor at Hankuk University of Foreign Studies (HUFS) in Seoul, South Korea where he teaches and researches Northeast Asian politics, international relations and foreign aid. His most recent publication is “The Real East Asian Aid Model: Development Assistance as an Instrument of Comprehensive Security in Japan, South Korea and Taiwan” in Development Policy Review. Image credit: CC by Office of the President of the Republic of Taiwan/Flickr.